“When we asked if we could see footage of the show, we were told ‘no’." As easy as it is to poke fun at licensed games like the infamous Aliens: Colonial Marines, looking at them from a different perspective raises a fascinating question. The process of making a licensed game involves a maze of stakeholders, scheduling concerns, and legal manoeuvring. Why do good creative opportunities and good developers release projects that are less than the sum of their parts? Tom Forsyth is an industry veteran who spent years at Valve and Oculus, among other companies. Once upon a time, though, he was a programmer on Blade 2. “For arcane licensing reasons,” Forsyth recalls, “we only had permission to use Wesley Snipes’ likeness in one place—the box cover—but Mr Snipes could not appear anywhere in-game. Of course Blade had to be in the game and he had to look as close to the Blade in the film as possible, but without looking too much like Mr Snipes who played him in the movie. No, this didn’t make any sense to anybody else either. So the artists were driven mad sending both concept and in-game art to the publisher, and every even week it would be ‘this looks too much like Snipes’ and every odd week was ‘this doesn’t look like Blade’.” Concerns like this one just chewed further into a razor-thin schedule, on top of the regular complexities of development. Blade 2 currently holds a 49 on Metacritic. “It’s a strange experience working on a project, knowing that it is not going to turn out well, knowing on some level that it’s not even really intended to,” says Steve Rhoades, a level designer for 2006 action game The Sopranos: Road to Respect. The studio was divided between two masters: THQ, their publisher, and HBO, the owner of the licence. “I remember meetings at a table with at least four or five folks from HBO present,” Rhoades says. “A lot of teleconferences. 7 Studios’ process was pretty document heavy by modern standards, and I wrote every level design doc for that game. My life for a few months was revising each document based on HBO feedback, then sending the doc to THQ, revising for their feedback, rinsing and repeating. I’m honestly not sure how many folks at either HBO or THQ had veto power, but both of their word was law from our perspective. Most of HBO’s feedback was to remove the stuff THQ had just asked me to add, and the reverse was equally true.” Rhoades left the studio before the game finished production, but his experience of working to contradictory mandates isn’t rare. Do we save the cheerleader? Steve Bowler was one of the lead developers on Gemini: Heroes Reborn, a game created to tie into the upcoming TV show’s release. “We were told on one of the conference calls that our biggest problem on the game art-wise was that ‘it didn’t look anything like the show’,” Bowler said. “When we asked if we could see footage of the show, we were told ‘no’. We couldn’t even fly out there in a locked office with our phones confiscated. They just said there was no way we were going to be able to see footage beyond the couple of trailers/commercials that were released.” The shortage of information impacted character abilities as well. 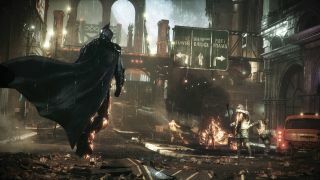 Some abilities would be rejected for being too similar to abilities used in the show, but the studio couldn’t offer a list for the developers to avoid. “I had to come up with a game where we called them back later with our laundry list of our A, B, and C tier abilities we wanted to use, and we’d go through them one by one and they’d tell us if we could use them or not,” said Bowler. His team ultimately had 11 months to produce the entirety of the game, as well as the framework of a tie-in mobile project. The stories go on and on, even for well-received projects like Friday the 13th: Killer Puzzle. The licence for that franchise is now trapped in a legal limbo that keeps all of the creators involved from doing anything further with their creations. When you see a bad licensed game, it could be that its development was an utter disaster. However it’s even more likely that everyone involved wanted to release something special, but didn’t have the time, corporate structure, or resources to enable its creation.